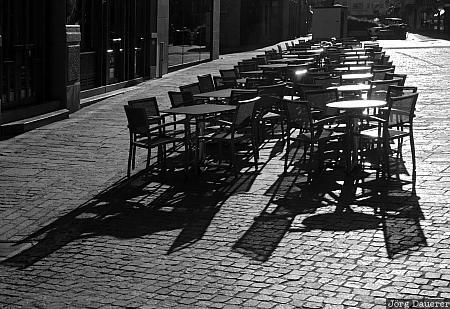 The chairs and desks of a street cafe at the market square of Würzburg backlit by early morning light. Würzburg the capital of Unterfranken in northern Bavaria, Germany. This photo was taken in the morning of a sunny day in May of 2010. This photo was taken with a digital camera.